Mitchell was a former US navy pilot who was selected to work with NASA in 1960. During the Apollo 14 mission (January 31–February 9, 1971) he became the sixth person ever to walk on the surface of the moon. Apollo 14 was commanded by Alan Shepard, a former Mercury astronaut who became the second person ever to travel in space (and the first American). During their moon mission both Mitchell and Shepard achieved the longest ever moonwalk of 9 hours and 17 minutes. An American hero rocks the establishment with his spectacular claim of having ‘inside knowledge’ about UFO cover-ups. However, there is more to Ed Mitchell than meets the eye. 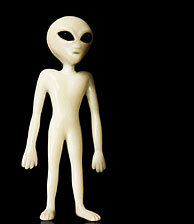 Polls show that many ordinary people believe that aliens have visited, and/or are presently visiting, the Earth. The beliefs of ordinary people are not usually seen as newsworthy, but because Mitchell has reached the pinnacle of success with NASA, it’s seen as a different story. Most would be convinced that he would be ‘in the know’ about such things, and as such, his claims carry seeming credibility. However, NASA was quick to throw cold water on Mitchell’s claims by saying, ‘NASA does not track UFOs. NASA is not involved in any sort of cover-up about alien life on this planet or anywhere in the universe. Dr Mitchell is a great American, but we do not share his opinions on this issue.’ For the ‘true UFO believer’, though, government denials only seem to reinforce the conspiratorial notion of cover-ups. It should be remembered that everyone who can reason will develop a worldview, and most people’s worldviews are underpinned by where they think they came from. I.e. if one thinks that God is Creator then it is likely that person will view the world and their existence with a Bible-centered worldview. However, if one believes that all life on Earth is the result of the chance random processes of evolution, then that belief system is applied to observations made in the universe around them. So if you believe that life evolved on Earth by chance then you would probably believe it possible, even likely, that life also evolved elsewhere in this incredibly enormous universe. As I showed time and again in my book Alien Intrusion: UFOs and the Evolution Connection, this pre-belief in extraterrestrial life is the dominant factor in people’s perceptions of what unidentified flying objects (UFOs) really are. In most cases, strange lights and objects are seen and interpreted as alien craft due to their beliefs in evolution combined with the modern cultural conditioning that the majority of population has received from the media, which has an obsession with extraterrestrial life (see also Evolution and the science of fiction). Many desire there to be alien life. There is a common belief that extraterrestrials got an earlier kickstart in the evolutionary process, so their technology might be in advance of our own in the order of millions of years. It is therefore hoped that these advanced aliens might teach humans how to solve our petty earthly squabbles, cure our diseases and solve environmental crises for us, like the global warming that is being alleged. As such, these beliefs have become a substitute religion. This is evidenced by the fact that many UFO/alien cults are some of the fastest growing religious groups in the world (e.g. Raelians, Scientology). In an article about Mitchell’s claims, Australia’s Daily Telegraph newspaper even posted several online videos as ‘proof’ that Mitchell is correct. Like most UFO sightings though, these videos, many of which were shot by ordinary people with their own video cameras, appear as strange balls of light in the sky—and nothing more ‘otherwordly’ than that. But they are wrongly interpreted as vehicles from another planet. Like most UFO claims, Mitchell’s are not accompanied by any physical evidence. When questioned later on Fox News about his extraordinary remarks, Mitchell revealed that he had never personally seen a UFO or had an alien encounter, and added that NASA are not involved (despite previously saying they were complicit). He said that his knowledge of such events had come from others, who claimed to be witnesses at the alleged alien crash landing at Roswell, New Mexico in 1947.6 So much for being in a ‘privileged position’. And how does he know that the thousands of other sightings he mentioned are really ETs as he claimed? Due to his changing story, Mr Mitchell must be regarded as an unreliable witness. However, he is not the only public figure that believes in the Roswell event. The event he referred to is better known as ‘The Roswell Incident’—the most famous UFO event in history. Official secrecy did surround a crash at Roswell. However, Roswell was not an alien event of cosmic significance, despite the continual perpetuation of the myth by the media and Hollywood. To find out what really happened at Roswell click here. Repeatedly, most of the so-called evidence of alien visitations is based on secondhand or even thirdhand reports of ‘I knew someone who once saw a UFO’ type stories. Many hear accounts from people who they believe would not make up such stories, and then these are related by others and so on. In the case of Mitchell’s telling of the tale, it seemed to carry more weight because of his reputation. So why do people make up stories? It is difficult for many to understand why seemingly credible witnesses make up fantastic stories—so fantastic in some cases that it would be normal to think that no one would make such incredible claims unless they were true. Human beings are complex creatures and for some their emotions and beliefs can override reality. There are also many cases of deliberate hoaxing and the fabrication of evidence in the desire to get others to believe one’s own belief system. In the case of the Roswell Incident, the book of the same name that really catapulted Roswell into the popular psyche was full of factual errors and contained such fabrications (as detailed in Alien Intrusion: UFOs and the Evolution Connection). In other words, for them the end justifies the means, not to mention that the resultant publicity could also result in a nice little financial windfall for the perpetrators (read about the alien autopsy movie hoax). On one occasion, supposedly secret Presidential documents were fraudulently manufactured (the MJ 12 documents) with the hope that the resultant publicity would force the government to ‘come clean’ about UFOs. The pre-belief was at work again. Sadly, such actions are not limited to UFOlogy—we’ve seen frauds perpetrated in the evolutionary community also, such as Archaeoraptor—Phony ‘feathered’ fossil and Piltdown Man. See also Why the epidemic of fraud exists in science today. Of course, my comments should not be misunderstood to mean that people do not see strange objects and even apparent craft in the sky, or have not had strange encounters with physical entities. But it does not automatically follow that they are extraterrestrial in origin. The question then remains, what are they? I do believe that there is something sinister about many such events. These sightings often display supernatural characteristics rather than natural ones, and our only reliable source of information about the supernatural realm is the Bible. Mitchell’s forays into the occult and New Age are certainly consistent with the associations of many such UFO-alien enthusiasts. We must be on our guard not to allow such experiences to sway us from the truth and deceive us into believing in the existence of intelligent extraterrestrial life and its concomitant underlying theory of evolution. Ecclesiastes 1:9 reminds us that there is nothing new under the sun. years.html>:, 31 July 2008. Return to text. About IONS, www.noetic.org/about.cfm, 1 August 2008. Return to text. 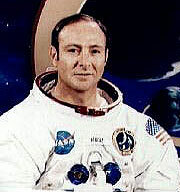 Edgar Mitchell, http://en.wikipedia.org/wiki/Edgar_Mitchell#cite_note-3, 31 July 2008. Return to text. A philosophical system that teaches that one can gain knowledge of a transcendent reality through revelation or through practice of the occult tradition. http://legacyweb.com/ptlbible/theglossary1.htm, 1 August 2008. Return to text. Edgar Mitchell alien discloser on Fox News, www.youtube.com/watch?v=4w82QPiuijU, 1 August 2008. Return to text.